Teaser Storyline for What Ever Happened to Aunt Alice?? and that he is working with her to solve Miss Tinsley's disappearance. Harriet is unaware of this. Mrs. M. goes to a fair at the Indian Reservation, with her nephew. Mike is also there and gives some money to an Indian who summons departed spirits in a tent show. When the first spirit is identified as "Miss Tinsley," Mrs. M. is shocked and runs from the tent. The next day Mike finds that Miss Tinsley had drawn her $9,000 balance from the bank just before she disappeared. Mrs. M. says they'll drive to an Indian festival. Mrs. Dimmock is dismayed--this will prevent her meeting with Mike. Pretending to be out of toothpaste she goes to town to locate Mike, but cannot. Mrs. M. finds her housekeeper has been lying. At the house, in the darkness between flashes of a sudden storm, Mrs. M. intercepts the housekeeper's efforts to telephone, and berates her for lying about her trip to town. She scornfully boasts of killing Miss Tinsley and her predecessors. They struggle for the phone and Mrs. M. knocks the housekeeper unconscious. Mrs. M. dons the housekeeper's wig, puts her in the car and from her cottage window, Harriet thinks she sees Mrs. Dimmock driving the car alone. Mrs. Dimmock stirs, mutters "I told..." and faints. Mrs. M. stops the car on the edge of a pond, and asks: "Whom did you tell, the girl across the road?" The car rolls into the pond, but before it goes under, Mrs. M. places the wig on the unconscious housekeeper, and leaves her in the sinking car. Later, Mrs. M. greets her nephew and says Mrs. Dimmock had gone to get her some medicine. The phone rings and George relays the message--Mrs. Dimmock has been found dead in the submerged car. Mike and Harriet enter and at the news Mike leaves. That evening Harriet reluctantly accepts Mrs. M.'s invitation for a drink. The hostess dopes James and Harriet. James is fidgety and she gives him her late husband's stamp album to quiet him. She walks them home, where they both pass out. Mrs. M. sets fire to the cottage curtains and leaves. The next morning she is amazed to see the cottage still standing and in her garden, men with shovels, sheriff's deputies, and Mike, Harriet and James. The boy confronts her, says he's still alive in spite of her drink and the fire she set, and that the stamp album Mrs. M. gave him is worth a fortune. Mrs. M. takes the album she had thought worthless, and with a quiet smile of madness, asks Mike to drive her to Tucson to apply for a job as a housekeeper. CAST of What Ever Happened to Aunt Alice?? 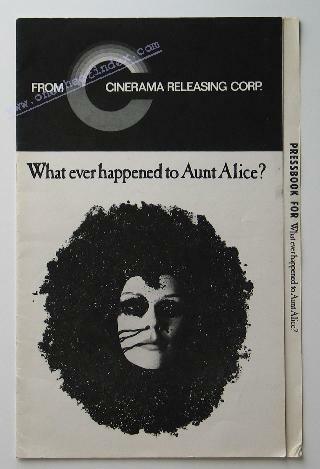 Credits for What Ever Happened to Aunt Alice? ?